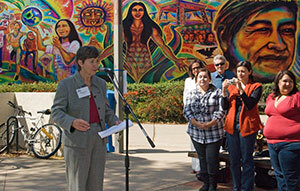 Chancellor Marye Anne Fox addressed the crowd during the unveiling of the Chicano Mural on Oct. 14. To Lorena Ruiz, a new 15-by-50-foot mural depicting Chicano history is like a huge campus welcome sign. Ruiz, a Thurgood Marshall College senior from South Central Los Angeles was one of three student speakers who attended the official unveiling Wednesday of the community mural, entitled “Chicano Legacy”. Hundreds of staff, students and faculty gathered at Peterson Hall, where the mural hangs, to celebrate the art project created by world-renowned, San Diego-based artist Mario Torero. The mural is a collage of vivid colorful images and features iconic figures in Chicano history such as Cesar Chavez and Dolores Huerta, along with San Diego landmarks Chicano Park and the Coronado Bridge. It was commissioned to truly reflect the diversity of California and symbolize the campus commitment to providing a public education to all groups in both our region and state. 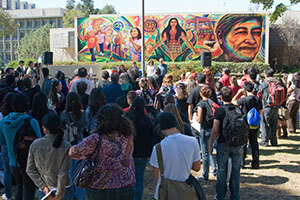 Hundreds of people attended the unveiling of the Chicano Mural outside Peterson Hall. The unveiling began with a blessing from UCSD alumna Maria Figueroa Chacón, now a professor at Mira Costa College. UCSD Chancellor Marye Anne Fox; Jorge Mariscal, professor of literature and director of the Chicano Studies program; Seth Lerer, dean of Arts and Humanities; and Thurgood Marshall Provost Allan Havis all gave remarks at the event. Administrators shared the stage with students from Movimiento Estudiantil Chicana y Chicano de Aztlan (MEChA), the Student Affirmative Action Committee (SAAC), and the Student Promoted Access Center for Education and Service (SPACES). 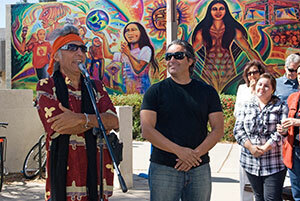 World-renowned, San Diego-based artist Mario Torero (left), who helped in the creation of the Chicano Mural, gave a speech during the unveiling ceremony.